Very good. I recommend you read it all. Monday marked the day that we had been in Iraq longer than we were in all of World War II. That's right. 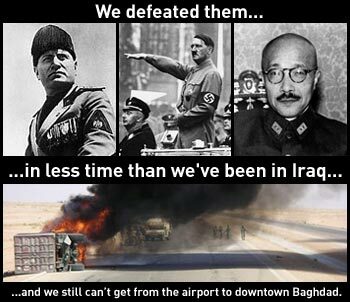 We were able to defeat all of Nazi Germany, Mussolini, and the entire Japanese empire in LESS time than it's taken the world's only superpower to secure the road from the airport to downtown Baghdad. And we haven't even done THAT. After 1,347 days, in the same time it took us to took us to sweep across North Africa, storm the beaches of Italy, conquer the South Pacific, and liberate all of Western Europe, we cannot, after over 3 and 1/2 years, even take over a single highway and protect ourselves from a homemade device of two tin cans placed in a pothole. No wonder the cab fare from the airport into Baghdad is now running around $35,000 for the 25-minute ride. And that doesn't even include a friggin' helmet. Is this utter failure the fault of our troops? Hardly. That's because no amount of troops or choppers or democracy shot out of the barrel of a gun is ever going to "win" the war in Iraq. It is a lost war, lost because it never had a right to be won, lost because it was started by men who have never been to war, men who hide behind others sent to fight and die. There are many ways to liberate a country. Usually the residents of that country rise up and liberate themselves. That's how we did it. You can also do it through nonviolent, mass civil disobedience. That's how India did it. You can get the world to boycott a regime until they are so ostracized they capitulate. That's how South Africa did it. Or you can just wait them out and, sooner or later, the king's legions simply leave (sometimes just because they're too cold). That's how Canada did it. The one way that DOESN'T work is to invade a country and tell the people, "We are here to liberate you!" -- when they have done NOTHING to liberate themselves. Where were all the suicide bombers when Saddam was oppressing them? Where were the insurgents planting bombs along the roadside as the evildoer Saddam's convoy passed them by? I guess ol' Saddam was a cruel despot -- but not cruel enough for thousands to risk their necks. "Oh no, Mike, they couldn't do that! Saddam would have had them killed!" Really? You don't think King George had any of the colonial insurgents killed? You don't think Patrick Henry or Tom Paine were afraid? That didn't stop them. When tens of thousands aren't willing to shed their own blood to remove a dictator, that should be the first clue that they aren't going to be willing participants when you decide you're going to do the liberating for them. And I wonder, does that $35,000 taxi ride include the tip? I stole that picture from Michael.